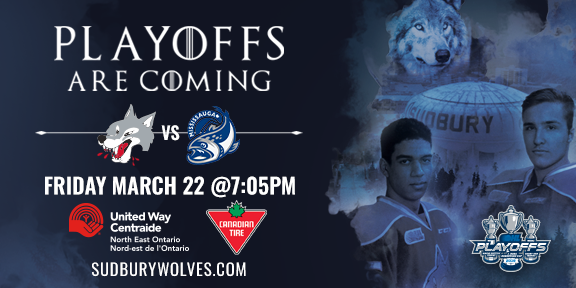 Wolves playoff action begins this Friday and Saturday at the Elgin Street barn as they will host the Mississauga Steelheads for the first two games of the opening round of the playoffs. Both games are set for a 7:05pm start. 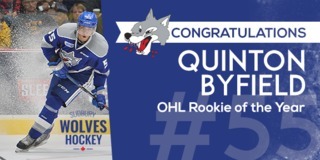 The Sudbury Wolves wrapped up their regular season this past weekend by collecting 4 out of 6 points. 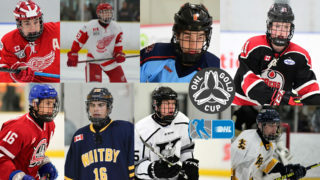 Starting on Friday, they defeated the Hamilton Bulldogs 8-4. On Saturday they beat the Peterborough Petes 3-1, and on Sunday they fell short to the Oshawa Generals. This resulted in the Wolves placing fourth in the Eastern Conference standings with 43 wins and 21 losses on the season for 91 points. 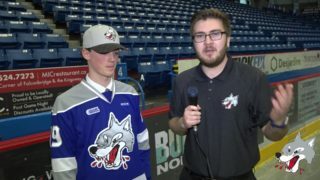 The team’s 91 points was the second most in franchise history in the OHL, second to the 92 points tallied by the 1994-95 Wolves. Friday night marks the beginning of the team’s seven game series against the Steelheads. 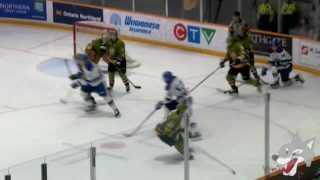 Although the Steelheads finished one spot behind the Wolves in 5th, Mississauga finished with 20 fewer points, collecting 71 points on the season. The Steelheads roster includes forwards Alan Lyszczarczyk and Cole Carter. 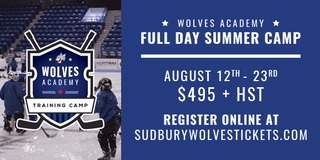 Lyszczarczyk is a former Wolf and acquired 82 points in the 64 games played in the regular season (39 goals and 43 assists) in split time between the Owen Sound Attack and the Steelheads. Captain Cole Carter capped off his regular season with a total of 68 points including 35 goals and 33 assists. The Steelheads are also backstopped by goaltender and Los Angeles Kings prospect, Jacob Ingham. 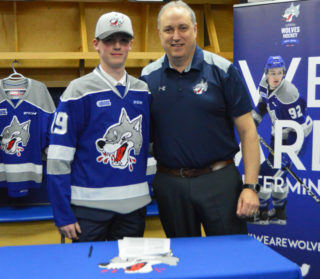 The Steelheads defence is led by 2019 NHL draft eligible prospect Thomas Harley. The Syracuse, NY native was ranked 9th among North American skaters by NHL Central Scouting during their Midseason Rankings. Friday’s game is sponsored by United Way Centraide North East Ontario and Canadian Tire. Beginning at 5:00 p.m., UWCNEO volunteers will welcome the first 500 fans with a complimentary sausage BBQ and a rally towel!